As employers continue to rethink hiring and retention strategies for our ever-evolving workforce, one resounding aspect keeps surfacing: the need for positive emotional connections in the workplace. The shift in human resources and talent acquisition from methodical to emotional techniques can be seen in even some of our most buzzworthy concepts: employee engagement, candidate experience and emotional intelligence to name a few. Emotion is now a predominant force behind today’s hiring and retention strategies, and for good reason! This emotional connection is formed from the very beginning. From the time a candidate applies to an open position, to their very first day of work and all through their tenure at a company, the emotional connection must be established to retain employees. Sound familiar? Retention starts from the application process to screening applicants to choosing who to interview. It starts with identifying what aspects of culture and strategy you want to emphasize, and then seeking those out in your candidates . . . You have to look at this as a long game, and take steps to ensure you’re doing it right by making sure each employee is completely engaged with and part of the company’s ongoing success. 50% of American employees have stayed at an unsatisfying job because of positive emotional relationships. 65% of American employees say they would look for a new job because of poor internal communication. What do these two facts have in common? A need for strong emotional connections in the workplace. While there are many more statistics and research to be presented for the case, it really comes down to logic. You’ve heard it time and time again, but in this candidate-driven market, employees don’t have to stay if they’re unhappy, feel unappreciated, dislike management or dislike their coworkers. We like to keep an eye on the quits rate because HR professionals know that when the quits rate goes up it is a sign that workers are growing more confident about the job market, and they may need to do more to ensure retention. Much like assessing for cultural fit, this one is more along the lines of evaluating the potential emotional connection an employee will have with the workforce. In order to get this right, you’ll want to have a clear gauge on the culture of your company. This can be done through culture surveys like TinyPulse! Understanding the differing personalities that make up your workplace is another great way to assess the potential emotional connection. Using a tool called Vitru, you can pre-screen candidates to assess their personality traits and work values to see how they align with the rest of your team. In the end, the point isn’t to only hire people who are capable of forming emotional bonds, the point is it acknowledge who is and isn’t, so future engagement strategies can be tailored. 53% of employees would stay at their company longer if their boss showed them more appreciation, and 81% of employees say they’re motivated to work harder after appreciation. Without regular feedback, employees have little idea about how well they’re doing their job, or how it affects the company as a whole. By letting them know, from day one, you’ve noticed their contributions, they’ll work harder and stay longer, too. How can new hires earn appreciation if they haven’t done anything yet? While they may not be contributing to output, you can always mention something specific in how they’re handling the transition. Notice that your new hire has made a point to chat up the secretary? Mention that you like how they’ve taken the time to get to meet everyone in the organization, or their friendly attitude is brightening up the office. Bottom line, reward and recognize behavior that is behaviorally based as well as skill-based. After all, engaged employees affect the bottom line more than you’d think. Not everything about building a strong emotional connection has to be about sunshine and rainbows. Sometimes it just comes down to being a solid foundation, something or someone the new hire can count on. After all, 22% of employee turnover happens within the first 45 days of the new hire being on the job. Make sure the onboarding process is organized, well-timed and impactful. With so much information to cover, organization is key. 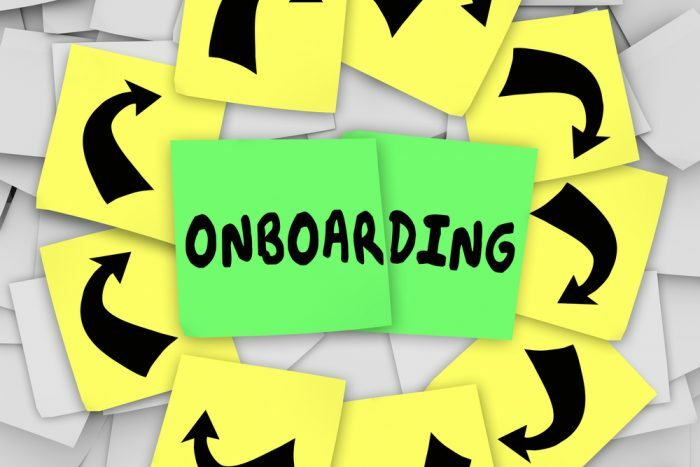 Without a solid onboarding plan, new hires can feel lost, nervous, anxious and worse… could even abandon ship! Building a strong connection with new hires from day one is a two-way street, so be an organization they can count on. How important do you feel it is to build an emotional connection with employees or even new hires? Feel free to share your thoughts and observations in the comments below!